I have recently become addicted to audio books. I just figured that they weren’t something I would enjoy and that my mind would wander and I would miss things as I was listening. I have now realized that this is not the case. I’m lucky that I have a job in which I sit at a desk all day. Some may not find that appealing, but I work in a capacity where I get to use my creativity on a daily basis. I decided to try out listening to audio books as I work and it has been a life changer. 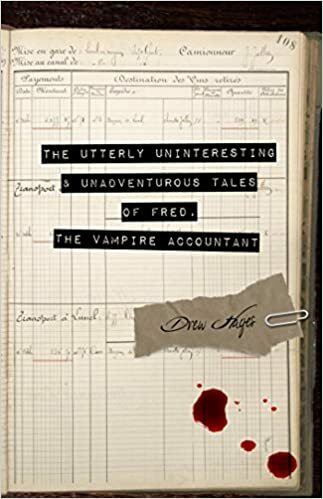 The Utterly Uninteresting and Unadventurous Tales of Fred, The Vampire Accountant happened to be the “Daily Deal” on the audible website one day. I had never heard of this story beforehand, but the synopsis was appealing and I decided to give it a go. Goodreads synopsis: Some people are born boring. Some live boring. Some even die boring. Fred managed to do all three, and when he woke up as a vampire, he did so as a boring one. Timid, socially awkward, and plagued by self-esteem issues, Fred has never been the adventurous sort. One fateful night – different from the night he died, which was more inconvenient than fateful – Fred reconnects with an old friend at his high school reunion. This rekindled relationship sets off a chain of events thrusting him right into the chaos that is the parahuman world, a world with chipper zombies, truck driver wereponies, maniacal necromancers, ancient dragons, and now one undead accountant trying his best to “survive.” Because even after it’s over, life can still be a downright bloody mess. The Utterly Uninteresting and Unadventurous Tales of Fred, The Vampire Accountant started out strong as I found myself wanting to learn more about this awkward vampire and his unfortunate life. The idea of a socially awkward, non-violent and timid vampire sounded very original and creative to me as you definitely don’t see much of them in the fictional vampire world. Initially, I loved how interesting and adventurous the story actually was! I loved the character of Fred and his long lost high school best friend, Crystal. Throughout the story, Fred finds himself as a new vampire in the paranormal world and his character develops well. As you can see, I loved the aspect of this story and the characters within. What I didn’t enjoy was how redundant it became. This story is divided into sections where each section chronologically tells the story of a moment in Fred’s life…or his death, if you will. The first few sections were great as we meet a few new characters that Fred interacts with including Crystal, Bubba who happens to be a were-steed and Albert, a young man brought back from the dead by his necromancer best friend, as a zombie. Obviously, this all sounds hilariously entertaining, as it was. The problem was about half-way through the story things started to blend together. Each story brought on a new paranormal bad guy in which the group of friends would have to fight off while Fred continuously discovered new things about himself. It was hard to recognize the climax of the story as there wasn’t just one, but rather multiple as they were scattered throughout each section. Looking at it, The Utterly Uninteresting and Unadventurous Tales of Fred, The Vampire Accountant was more of a collection of short stories. I don’t mind short stories, but I would have liked to have had a little more warning before getting into the story. I found myself becoming a little bored with this audio book as it went on as it just seemed to drag on. What started off well ended pretty poorly, not in terms of the writing or characterization, but more in the way that I just started to lose interest.